I wanted to make a scenic wall because I really like those, yet I never seem to get them right..
YAY! C.C.! And don't worry..... you'll find out who she is..... e_e Lolz. Kidding. There are so few good walls of her! Thank you for this! It's very well done! I love the grass..... I can't do grass...... I use the preset brush in Adobe 7........... just don't tell anybody that. oh darn this is a comment! x.x +Favs! wonderful wallie! 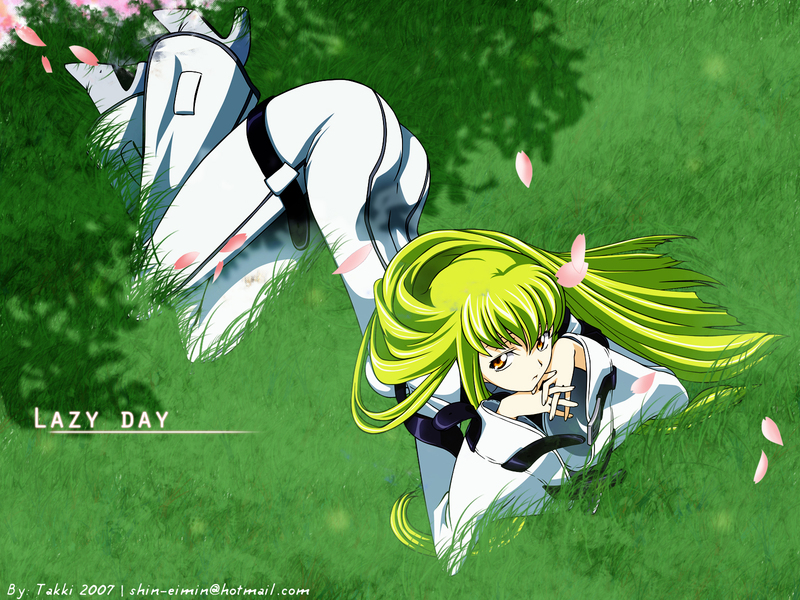 I like the grassy background coz it just suits C.C. 's pose so nicely. The tree shadows are neat and the green scenery is so soothing, a very comfortable overall view! ;) good job! You did a great job with this. C.C. really looks like she's on the grass (which is hard to do). Thanks for sharing! Nice wall! You did a good job of placing C.C. on the grass. Keep up the great work! Beautiful job. My only suggestion is for you to have painted the background a similar green color to prevent white spots showing thru the grass (for the spots you missed). :) Thanks for sharing! That is an awesome paint job and you also don't need to do any improvements. Awesome wall, the expression on her is so cool. I love the grass too, good work. A really beautiful wallpaper.One of the best C.C. pictures I have ever seen.The textures and graphics are amazing and the background is awesome.Great job!